Caption: Cover art for our 2018 EJ Summit program. Celebrating 20 years of promise, change, & action! Our annual environmental justice summit has been a cornerstone critical to the resilience of our network. It’s an opportunity for us to gather together, exchange knowledge and experience, share our stories, and be refreshed to take on the important, difficult work ahead. This EJ Summit is particularly special because its our 20th year of NCEJN. It offers us the opportunity to reflect on the victories and challenges of the past 20 years and position ourselves for the future. We’re celebrating change – where we’ve been and what we’ve done. And we’re celebrating action – the steps that we will take to get us to where we want to go. We are revolutionaries. We choose revolution when we choose to challenge the status quo – when our actions are counter to the systems that oppress us. Twenty years of the NC Environmental Justice Network is a revolution. Our collaboration, commitment to each other, and mutual support is a revolution. October 19-20, 2018 – Add it to your calendar! You may find a hardcopy version of the registration forms here: (.docx and .pdf). Please email to ncejsummit@gmail.com or mail to P.O. Box 68, Rocky Mount, NC 27802. You may also fill out the online registration forms linked below. Option 1: Click here to be taken directly to NCEJN’s PayPal link. In the notes box, please mention that this is for your registration fee for the 2018 EJ Summit (e.g. “Friday only 2018 Summit” or “donation for 2018 Summit”). Option 2: You may pay with your credit card through a PayPal link provided on NCEJN’s website. Go to https://ncejn.org/. On the right side of the page, there is a “Donate to NCEJN” button. Click on that. Enter the cost of your registration fee. If you do not have a PayPal account, but would like to use a credit card, there is an option for using a credit card. Click on that. This will allow you to enter in your credit card information. In the notes box, please mention that this is for your registration fee for the 2018 EJ Summit (e.g. “Friday only 2018 Summit” or “donation for 2018 Summit”). Once your payment is submitted, it goes directly to our NCEJN PayPal account. Thank you for registering for the 2018 EJ Summit! If you would like to make any changes to your registration, please contact the EJ Summit Coordinators. We look forward to seeing you in October. If you are requesting lodging at the Franklinton Center, please fill out the Lodging questions in the registration form. Lodging at the Franklinton Center will be reserved for those requesting the Impacted Community Scholarship and the Student Work Exchange until September 30, then available rooms will be opened up to General Registrants (i.e. lodging for scholarships is not guaranteed after September 30). All Franklinton Center rooms will have at least 2 people per room. All registrants that have requested lodging at the Franklinton Center must notify the Coordinators by October 10 if lodging is no longer needed; otherwise, you will be required to pay $25 for the dorm room and $40 for the hotel-style room. Those that are General Registrants and would prefer to stay at the Franklinton Center will be put on a waiting list. On October 2, any available rooms on-site will be assigned to the General Registrants on the waiting list. Dorms will cost $25 per person and hotel-style rooms will cost $40 per person. People that do not want to stay on-site or that need to have lodging secured prior to October can reserve a room at the Country Inn & Suites for $79.00 per night for Friday night under the reservation name NCEJN. Additional Off-site Lodging information for General Registrants: The Country Inn & Suites has reserved 5 rooms with two queen beds and 3 rooms with one king bed for EJ Summit attendees. You are responsible for contacting the hotel directly to book your rooms and to make it known if you are willing to share the double queen room with another EJ Summit attendee. The King rooms also have a roll out bed for an additional $10.00 if you would like that option. When you call the Country Inn & Suites, make sure to say you would like to book one of the rooms reserved for NCEJN. The room rates are $79.00 per night for Friday night only under the reservation name NCEJN. The deadline cutoff date to reserve a room is October 7th. The NCEJN reserved rooms at the Country Inn & Suites will be released by the end of October 7. Any reservation cancellations will have to be made by October 12th. *** Please feel free to bring your own instruments for the networking and music time. Call for Research Presentations – We invite all interested parties who would like to present at the 2018 EJ Summit to submit papers that address environmental justice topics from any disciplinary perspective, including environmental sciences, social sciences, humanities, law, journalism, public health and medicine. Sponsorship – Able to help sponsor the EJ Summit? Go here to learn how to contribute money to the 20th Annual EJ Summit. 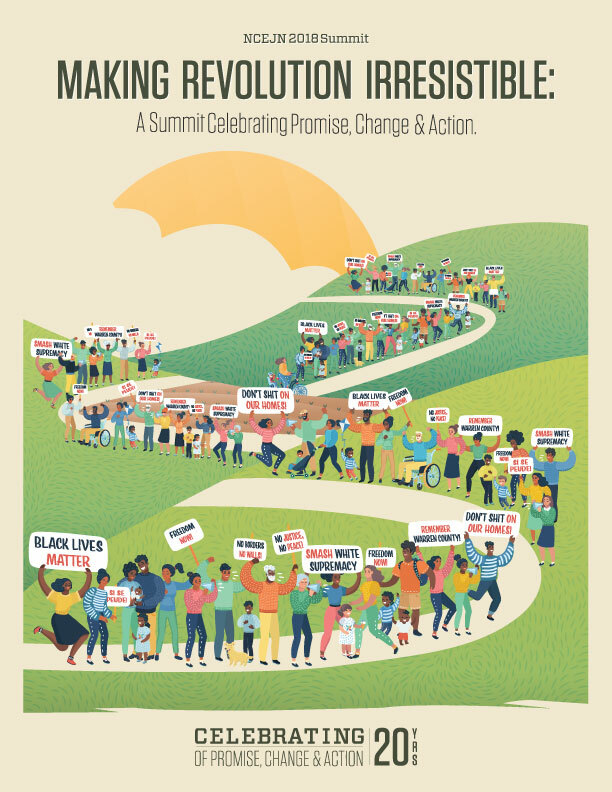 History of EJ Summit page – Go here to learn about the history of the EJ Summit as well as find archived programs, pictures, and videos from past EJ Summits. If you have additional archival materials from past EJ Summits that are not shown on this page, we welcome you to share those materials with NCEJN. Please contact the EJ Summit Coordinators (ncejsummit@gmail.com) with that information.